I'm not really sure if this merits as an overlooked movie, since it's quite of a cult classic. Leonard Kastle's The Honeymoon Killers from 1969 is what's usually called a "sleeper", a film whose status has grown over the years, a film that pretty much went by everyone during its initial release. And it's also a film whose status really deserves that growth: it's an excellent crime film with lots of dark overtones and with an artistic touch that makes it stand out amongst its contemporaries. The story's about the real case of Raymond Fernandez and Martha Beck, two unlikely lovers who got each other mixed up in a scam of marrying stupid elderly women and ending up in killing them. It's an ugly story and Kastle doesn't shy away from it. He gives no clues as to what drives these two people, which makes the movie even more chilling. Kastle denies the easy identification from the viewers. This is intensified by a rather Godardesque use of music - Gustav Mahler whom Kastle admired very much. The film is shot in murky black and white, some of the set pieces are pretty clumsy, but there's also some great photography and mise-en-scène. Kastle shines out the best as a director of actors: all of them give marvellous examples of great acting. The script must've given them plenty to work with, since the characters are full-blown human beings, even in short sequences - they are not caricatures. It makes The Honeymoon Killers touching and very humane at heart, even though on the surface it's a ruthless story about two ruthless - and rather clueless - killers. But I really, really love Shirley Stoler and Tony Lo Bianco in this. Marvellous! Excellent! And ahead of their time, I should say. You didn't see this kind of acting in Hollywood films in the late sixties. Highly recommended, if you ever run across it. More Overlooked Movies at Todd Mason's blog. So, it's bye-bye, Pulp. (Here you can read my farewell to the printed Pulp from two years back. Seems like I didn't think of going the web-version at the time!) I'm thinking of compiling a collection of articles and essays that were mainly published in Pulp, so all this work wasn't for nothing! I wrote about this silent Danish science fiction movie some weeks ago here. I had a chance to see the whole film at the Tampere International Film Festival a week ago. The film proved to be a disappointment, though the lavish sets made an impression. The space ship looks good and the special effects are nice for 1918. The storyline, though, is pure hogwash: after landing on Mars and meeting the Martians who are vegans and seem to practice a religion that has a feel of Theosophical nature, with its overtones of mutual love and deeper understanding of what people are, the movie starts to drag pretty badly. The ending, with its dramatic return back to Earth, is an improvement, but is sadly not enough. Not all the silent movies are gems. The restored copy looked very good, though. However, here are more Overlooked Films for your Tuesday pleasure - or rather Wednesday, since it's almost ten o'clock here in Finland as I write. I have some reservations, though. The drama is rushed at points, and important stuff is bypassed too fast. The main actors are not very interesting - I already forgot their names -, though Dejah Thoris looks great. (Her transformation into a sword-yielding science woman is a good thing, a trembling Victorian-era princess would be stupid in 2012, though the science bit isn't very convincing. Her sword-yielding and good physics seem to serve up to those nerdy teenagers who like to fantasize about sword-yielding princesses. The Dojah Thoris of the film might not be someone with whom the female audience empathizes with.) The battle scenes are at times confusing and sometimes even not very exciting. The main baddies (the priests of Iss) are over-written. My main gripe is that the film is too damn serious! Some have said it's stupid and full of fluff, but I thought the movie could've benefited from being funnier, more ironic in the good old swashbuckling manner. 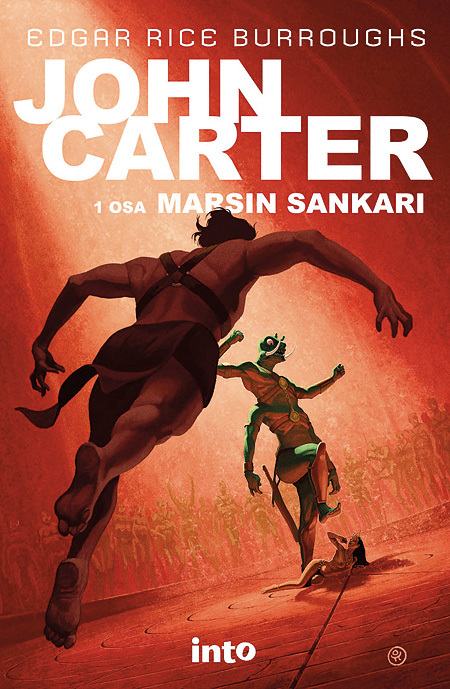 John Carter's transformation into a cynical loner seems forced, but than again the cynical anti-hero has become almost a cliché in the recent times. The tharks are not entertainingly hostile anymore, they are just plain hostile. Tars Tarkas's heroics feel imposed upon. The frame story with the Martian priests on Earth also feels forced - it also feels like they're going to do a TV series on this. But with these reservations I'd give the film something like two and a half out of five. I also reread the first two Mars books by Burroughs, with the new cover illustrations by Ossi Hiekkala (see the photo above). The better of the two is the second one, The Gods of Mars. The story never slows down during the first 100 pages. It's pure wonder of story-telling. The first one, however, seems even haphazard at times. The genre rules of the Victorian time also slow the story down. The magic is still there, though, and Burroughs remains one of the most influential writers of the 20th century. Nota bene: I edited the bit about Dojah Theris's transformation, as I happened to read someone else's opinion on that and I got to thinking about it again. My friend and colleague Jukka Halme read my novel Jumalten tuho / Twilight of the Gods and said thus: "I really liked Twilight of the Gods, it had quite a lot of speed, and amongst all the frenetic violence there was some interesting character development. And who wouldn't like the book with that kind of name gallery?" Jukka refers to the fact that almost all the characters in the book are named after Finnish pulp fiction and other writers. I'm having a contest over at my Finnish-speaking blog here. I also started posting the original "Jumalten tuho" short story as a serial over there - it was published in 1988, so that's pretty old and awkward stuff! 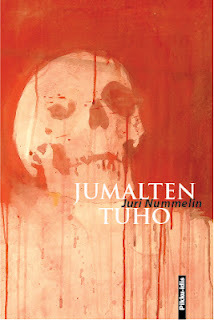 Jumalten tuho from Juri Nummelin on Vimeo. In 1918: the horrors of the Finnish Civil War. In 1928: the best kept secret of Christianity is released upon world in Forssa. Can the hungover police officer Tanner save the world?